Sometimes you just don’t have many documents about a person to form much of opinion about them. They don’t take shape in your mind’s eye. There are no descriptions about their physical appearance or their personality and all you have are questions and possibilities of who they might have been. I struggle with these issues when I try to create a biography of Rev. McNair’s son Alfred. Just who was he? 1850 Census: He is 8 years old and living in Lancaster, Pennsylvania with his parents Rev. John McNair (42), Susan Adeline (27), sister Eliza (10) and housekeeper Margaret Coyle (40 and born in PA). Jun 1863: Civil War Draft Registration – Alfred is 21, living in Clinton, New Jersey and he is a merchant. So many unanswered questions about Alfred that we will never have the answer to…. Why did he give up studying law? Why did he become a merchant? Was he not interested in the law? Did he “flunk” out? Why didn’t he join the military in the Civil War? Did he want to, but his parents convinced him to stay out of the war? Or did he want to avoid serving? What was he doing jumping on a train? Was this a regular thing that young men did or was Alfred drunk/impaired when did it? What was his character? Was he troubled or was he just still young and foolish, cocky and uncoordinated? So many unanswered questions and no way to find the answers. However, we do know that his family must have been devastated to lose their son at 24 years old when there were so many years ahead of him. 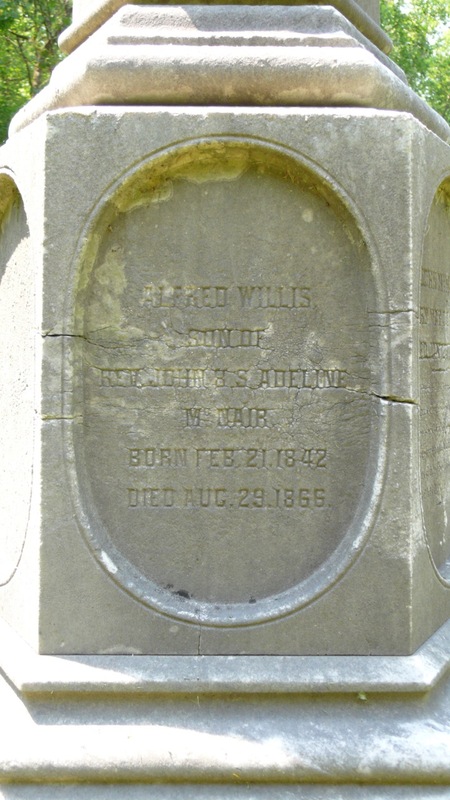 This entry was posted in McNair Family, Writing Family History and tagged Alfred Willis McNair, Rev. John McNair. Bookmark the permalink.